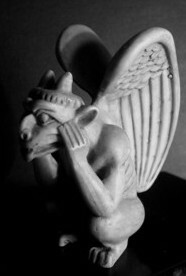 The Thirsty Gargoyle: Choose Life. Choose Military History. Choose Counting. Choose Life. Choose Military History. Choose Counting. A hundred or so years ago, the Prussian Hans Delbrück transformed military history when he sought to show how warfare and politics mirrored each other as social activities. Using his method of Sachkritik, he analysed historical battle narratives in the light of simple physical realities and what was known to have happened in other battles. These were German miles rather than the ones we know, and the Persians obviously didn’t march in the Prussian fashion, but still, Delbrück had made his point: Herodotus’ figures were ludicrous. Delbrück didn’t stop at the soft target that was Herodotus, either; he went on to explain the impossibility of Atilla the Hun easily moving an army larger than the Prussian one of 1870 across an area that at that time lacked decent roads, and to show through issues of food supply how Julius Caesar’s figures for his Gallic opponents had been grotesquely inflated to superb propagandist effect. When I was doing my master’s degree on Hannibal’s victory at Cannae, I spent an immense amount of time grinding numbers in a way that numbed the brains of my friends when I talked of them. Marching rates. Space per man. Unit depth. Legion width. Quantity of vegetation needed daily to feed an elephant. Close order formation. Open order formation. Manipular replacement. Javelin range. It went on. All of this stuff may have sounded boring, but it was needed as the nuts and bolts of assembling a thesis on what exactly happened in the biggest and bloodiest battle the Romans ever fought and lost. Who said this stuff isn't useful? I’ve moved into a more conceptual area of ancient and military history now, but the whole battle reconstruction thing has given me some habits. On Saturday they came into play. There was a march in Dublin on Saturday, billed as a ‘March for Choice’, with an expected attendance, according to the organisers, of thousands from across the island of Ireland. It turned out to be rather a damp squib, with a few hundred gathering on O’Connell Street, and accumulating numbers as they made their way over the Liffey towards Kildare Street and round to Merrion Square. “Less than 1,000 people joined the ‘March for Choice’ in Dublin this afternoon in what had been billed as the first major mobilisation of pro-choice activists ahead of the publication of a major report examining how the Government should deal with the abortion issue. Organisers had predicted that several thousand people would gather for the march which left the Spire in O’Connell Street at 2pm ahead of a gathering at Merrion Square. This report was at odds with what people associated with the march claimed; the Labour senator Ivana Bacik said on Twitter that 5,000 had attended, and one person who’d acted as a steward on the march wrote on Facebook that she had personally counted 3,200 people, with a Garda she spoke to having said that between 3,000 and 5,000 people had marched. Sinéad Redmond, one of the march organisers, rejoiced at how happy the 5- to 7,000 who she said had marched were. Graham Linehan, ever the sentinel of the internet, declared on Twitter that “The Irish Times is a ****ing rag”, subsequently saying that Irish Times’ reporting was either prolife propaganda or sheer laziness; not for one moment does he appear to have entertained the possibility that it might have been right. People connected with the march began appealing for pressure to be put on the Irish Times to change its story, and eventually it did so. Why exactly did you change your story? “Their numbers swelled to several thousand by the time it reached St Stephen’s Green. The Garda Press Office, which earlier put the number of attendees at about 500, said this evening there ‘may have been in excess of 2,000 people involved’”. So after repeated phone calls, the Guards shifted from saying that around 500 were involved to a claim that perhaps more than 2,000 participated, and after criticism from irate marchers and their sympathisers, the Irish Times went from reporting that fewer than 1,000 took part to claiming that several thousand marched. The Journal reports that the Guards said about 2,500 were in the march. Even if true, this hardly merits the adjective ‘several’ the Irish Times is now talking of, it has to be said. Now, let’s think about numbers. I know, whether it’s right or not to end the life of another human being isn’t a numbers game, but we’re solely talking about reporting and how numbers can be used to propagandist effect. As people argued on Saturday afternoon about the numbers attending, a common cry on the pro-choice side was to look at the video, as the video showed that there were thousands of people on the march, not just a few hundred. It’s worth looking at the video, shot by Darragh Doyle just by the Shelbourne Hotel. It’s difficult to estimate numbers on it from a casual glance, as Darragh pans back and forth several times, giving the impression of a vast throng of people. The video lasts for just over two and a half minutes, and for the first minute and a half the marchers can be heard eagerly chanting – those bringing up the rear just amble along chatting to each other. The marchers were marching in informal rows four, five, six, eight, maybe even ten across on the odd occasion. Most rows, for want of a better word, seem six or seven across. Assume, for the sake of argument, that the typical row is eight across, and then count the people who go by the camera, as though each is the end of a row. You won’t get an accurate figure, but you’ll get a ballpark one, something to give you a fairly decent feel for the size of the crowd. I tried it on Saturday, and made it about eighty rows, before what looked like an uncountable mass at the end. 640 marchers, plus maybe another 150, so. 790 people, allowing for error. How much error could I have made, though? Could I have undercounted by more than one or two hundred? I tried again earlier today with a different approach, thinking about how much space those marchers seemed to have covered, and bearing in mind how a friend on the march has said on Saturday that the marchers had been almost the full length of Kildare Street; he reckoned there’d been about 1,500 or so there. 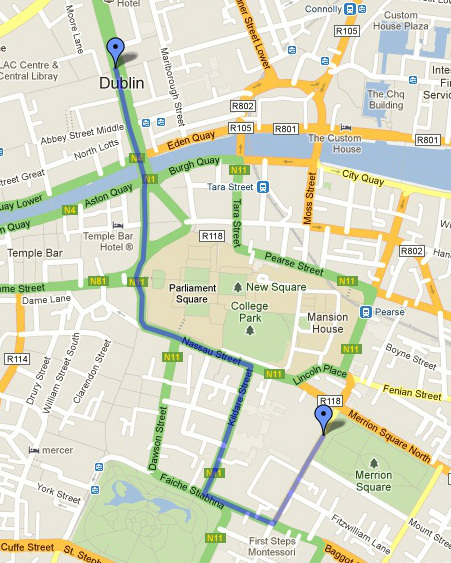 Looking at Google Maps, it seems Kildare Street is about a thousand feet long, so let’s assume my friend was right – allowing for slight exaggeration – and that the march occupied more than three quarters of the street. 800 feet of marchers, so, on a street about 30 feet wide. This would probably provide room for 960 Roman soldiers, give or take; more could have been fitted in, but only in a very packed formation. I could do the sums, but it’d take us off topic by some way. The people in the march weren’t packed together. Their deployment, for want of a better word, was nothing like a Roman army in close formation. The rows, however wide, were fairly close together at the start, maybe three feet or so apart, but by the end the marchers – dawdlers in many cases – were well spaced out, some pushing buggies or even cycling! There was no comparison between the relatively close front rows, with their chanting and shouting, and the stragglers at the back, strolling along and having a natter. Given this disparity, it’d have been reckless to have counted, say, all the rows in the front hundred feet of the march and then multiplied it out, as is a fairly standard way of calculating the numbers involved in a march. Now, in case you’re wondering, I was a teenage Commerce student, doing statistics and economics etc before changing subject and doing something more challenging the following academic year, so am reasonably clued in to how statistics work. I know that when moving crowds need to be counted, professional crowd counters use assigned counters to tally people passing points in given time periods and calculate upwards accordingly – indeed, I’ve had friends who’ve done this – but for a crowd this small that kind of thing is neither worthwhile nor necessary. After all, during the two-and-a-half minutes’ filming, Darragh saw most of the march go past him; if he’d hung on for another minute, maybe 90 seconds, he’d have seen the last stragglers dawdle by. Four minutes. That’s not worth sampling. It’s clear that there were no such counters present, in any case, and we don’t have high quality aerial footage of the march. We just have several foreshortened shots of the crowd, statements from marchers who – vested interests aside – were in the march and thus not really in a position to observe and count the marchers, widely differing guesses from the Guards, and a YouTube video that doesn’t even try to convey the march size in an accurate sense. As such, flawed though it is, we can really only go by the YouTube video which shows that the marchers, even in the front ranks, were generally rather more than an arm’s width apart, and that towards the rear of the march the crowd density was a lot thinner than in the van. This wasn’t even a reasonably compact crowd. Given how the spacing seemed to work, I couldn’t help but think the Roman figure gave a useful guideline for an educated guess. It looked about right, recognising just how spread out the march was. And it wasn’t that far off my first estimate. Again, it was only a ballpark figure, but it was one that suggested that the march probably wasn’t more than a thousand strong. Or Counting. That’s good too. I learned that in primary school. Still, as discussion about this carried on today, I gritted my teeth and decided to count people in the video as best I could. Given the relatively small size of the crowd, this was going to be a manageable task, even if it was bound to be a tedious one. I worked through the video, pausing and taking screenshots as I went, using banners and distinctive people in the crowd as markers for when I scrolled forward or to be returned to after Darragh had finished his latest bout of panning. And then I worked through the shots, marking people with red spots. I decided to estimate upwards, such that anything I thought might possibly be a marcher would be counted as such. The handful of pedestrians walking past at a normal speed, rather faster than ‘marching’ pace, had to be discounted, of course. I made it 850 marchers, more or less. Not a thousand. Not two thousand. Not five thousand, Ivana Bacik. Not seven thousand, Sinéad Redmond. Not a lazily non-specific several thousand, Irish Times. Because even if I undercounted, and I suspect I'll have missed a few at the marker points each time, I didn’t undercount by that much. Don’t believe me? Well, why should you? Please try it yourself. It doesn’t take that long. We shouldn’t even need to have this discussion. The rights and wrongs of abortion aren’t a matter of numbers, so I don’t see why those involved in Saturday's march have been so determined to exaggerate their numbers so egregiously. Still, if Saturday’s march tells us anything, at the very least it shows us that there’s no great democratic demand for abortion in Ireland. 850. The Irish Times was right the first time. Thanks for all your hard work TG. As a former soldier with a BA in Greek & Roman Civ (from UCC back in the 80s) I certainly can see where you are coming from with the numbers! As to why the 'pro-choice' folk want to inflate the numbers, I presume it is because they're trying to create the impression that their 'cause' has way more popular support than it has. I, like you, noticed that the IT figures took a mighty leap upwards from the first report to the last & was mighty puszled. Shame on them, & all parties, for bowing to pressure on this. Congratulations. Even RTE stayed away. Only the "paper of record" could be so outrageously impartial. Can there be any further doubt about pro-abortion bias in the Irish Times? They should stick to property management websites. Just shews how accurate you row counting estimate was. And as for two-and-a-half (thousand) being 'several'; well that's just misinformation; shame on them. O yes Mr Gargoyle I forgot to add. It is still a matter of debate, but it appears that there were no elephants at Cannae. Only 2 or 3 survived the crossing of the Alps, and the rest died shortly after. As you know Hannibal arrived in Northern Italy in the depths of winter so those remaining would not have survived much longer, especially as the Cathaginians had several major battles with the Romans before Cannae. It was his Numidian cavalry not elephants that got him the victory here, and they switched sides to the Romans to ensure Hannibal’s eventual defeat at Zama. Interestingly, the Romans were appalled by the child sacrifices of the Carthaginians, and used these to great propaganda effect with their wavering allies. When I read about the worship of Tanit I was struck by the comparison with our own culture of death. World history would have been very different if Hannibal had been able to follow up on Cannae. Unfortunately killing the innocents has still not gone away. Wonderful post, TG! Never thought I'd see such a felicitous combination of Roman military history, statistics and dogged persistence in the service of such a good cause! Thanks, TG. I enjoyed your military history lesson. I remember covering a pro-life rally for RTE and standing outside Trinity College counting the marchers as they passed. I rounded UP the number to the nearest thousand, but still got a call criticising my story on the basis that there were "twice as many" people at the rally! But this post really does highlight the careless reporting by the Irish Times on this particular demonstration. It reminded me of Tolstoy's description of the Battle of Borodino in War and Peace. As soon as the first volleys of heavy guns went off, the palls of smoke would have occluded Napoleon's view from the brow of the hill, rendering subsequent orders for deployments he delivered to galloping back-and-forth adjutants not only absurd but positively dangerous. It made me wonder, also, if one could not statistically adduce how many of the marching women you counted may have been pregnant? That might have boosted attendance figures.